Last night, as I was crafting this post in my head, it was going in a whole other direction. I was going to have a picture of Isabella posed in a special shirt and proclaim to the world that she was going to be a big sister. But then life took a turn. Let me step back. Back in 2008, before Isabella, I was found out I was pregnant on a Friday evening in February. I took the test and we jumped up and down with the positive results. We immediately called up my parents, took them to dinner and broke the news. We were young and happy and had just been blessed with a miracle. 2 days later I had a miscarriage. I was devastated. I was 5 weeks along and miscarriages at that stage are pretty common. People quoted the statistics to me and part of me felt silly for being so sad. I mean, we’d only known the news for 48 hours. Is that long enough to bond with a baby? We had embraced the fact that we would be parents and were overjoyed. We talked about names and nurseries and genders. We bonded with that baby. Now that child is up in heaven, an Angel watching over us all. So imagine my fears when almost exactly 1 year later we again got a positive pregnancy test on a Friday night in February. This time we were cautiously excited. We told our family but that was it. I was terrified when Sunday came around. I was just sure history would repeat itself and we’d have another loss on our hands. But no such thing happened and our beautiful darling daughter was born 9 months later. And what a gift she is! That was nearly 2 years ago. Isabella’s birthday is September 30th and her present will be a new house! Fast forward to a Friday night in July. My period was a week late and sure enough, two pink lines showed up on the test stick. I was pregnant again. We rejoiced at the news but were still hesitant. We know what can happen. 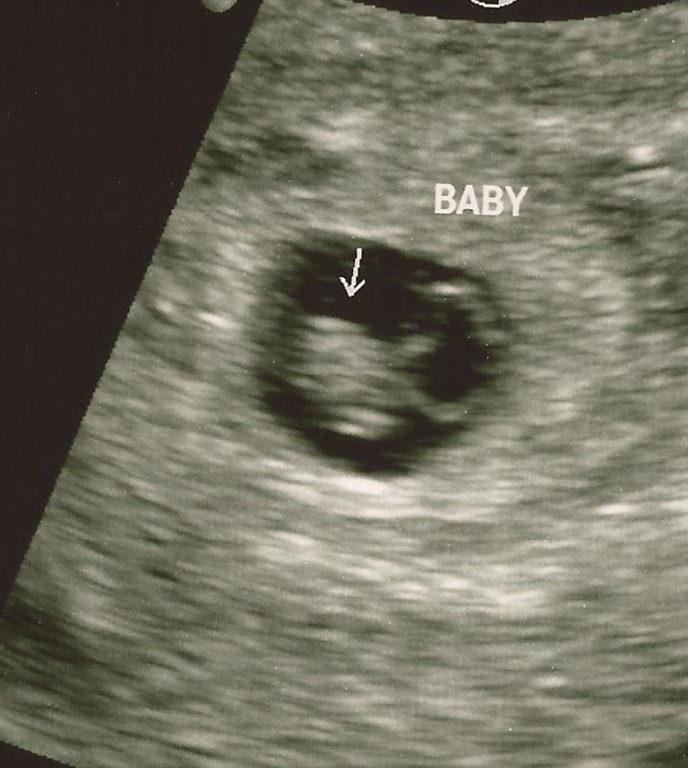 I went for my first pre-natal appointment on August 3 and saw the heartbeat and got a picture of the little bean. Here’s a picture I took of myself on that day. It was the first in a series of belly pics. What a relief that was! To see the heart beating was so amazing and a good sign of things to come. 2 days later I woke up to blood in my underwear. It was just a little but the sight of it sent me in to a panic. I cried in CJ’s arms. I told him I was sure the baby was gone. He calmed me down and said we’d call the doctor and see what she said. She wanted me to come in for an ultrasound. I went in and everything was fine. Again I saw my little one’s heartbeat clear as day on the monitor. The bleeding was simply implantation bleeding. Life went on. We sold a house. We bought a house. Everything was falling in to place. Then I woke up today with more bleeding. It was very slight and faint so I wasn’t too worried. There could be a million reasons for that. But it’s better to be safe than sorry so I called the doc. She asked me to come in. I was scheduled for a regular check-up tomorrow anyway so might as well move it up a day. When I got there she had me hop on the table and she broke out the Doppler machine which can detect the sound of the heartbeat at 10 weeks, which is where I’m at. She moved it around and worked it for a good 3 minutes without finding a heartbeat. It was that dreaded moment that every mother fears – going in for a regular exam and hearing nothing on the machine. She said that sometimes you can’t hear it yet and we’d do an ultrasound. After a minute of not seeing anything on that she moved to the vaginal ultrasound. I already knew at this point. My heart knew. My mind knew. Even though the doctor hadn’t said the words, I knew. After taking some measurements she turned the monitor around and showed me that there was no visible heartbeat. According to her measurements, it looked like the baby had stopped growing at 7 weeks 4 days, which was 3 weeks ago. But she wanted to be sure. So she sent me upstairs to radiology, where they have better equipment. She cautioned me not to expect a miracle but we needed to make extra sure the baby wasn’t viable before proceeding with anything else. I headed up to radiology and while waiting, called CJ. Saying the words out loud to him, “They can’t find the baby’s heartbeat” made it real and I lost it there, alone, in the waiting room. I squeaked out the rest of the details to him and slowly pulled myself together. We talked for a bit and then they called my name. As the tech did her thing, checking all the areas and taking measurements, I just watched the monitor. I saw the little bean that was my child, laying in its little sac. It looked peaceful and still. Very still. No heartbeat. No movement of any kind. Just a shape. The tech gave me her condolences and had a nurse come up to take me down to the doctor. We went the back way, through the staff only hallways, so that I wouldn’t have to go out and see all the expectant mothers in the lobby. We chatted and she was very nice. I kept myself composed, not one to cry in front of strangers. I don’t really remember what we talked about. I’m pretty sure I gave all the right responses but I was in a fog. 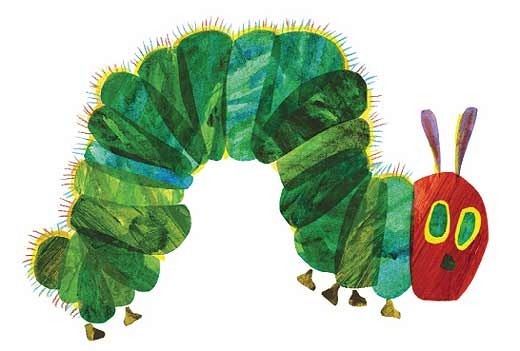 I remember walking by a door that had a picture of the Very Hungry Caterpillar on it. That was going to be the theme for our little one’s nursery. It stung a little to see it, but I just kept walking. The doc explained the options to me. I could either take some medication that would empty the baby and tissue out of my body or have a D & C surgical procedure. The medicine would be painful and involve a lot of bleeding over the course of a day or two. The surgery would be in and out in a day. I opted for that. No sense in dragging it out. I’ve been pretty numb most of the day. 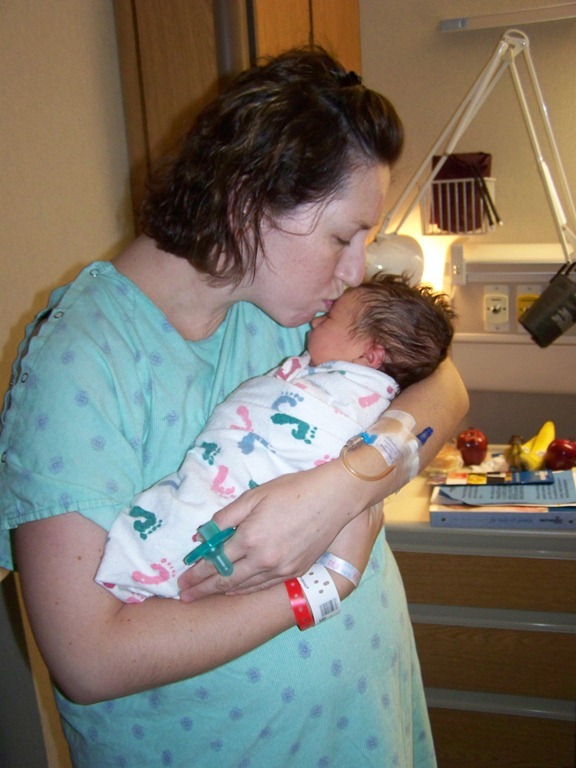 With the first miscarriage, my emotions were all on the surface and the slightest little thing – seeing another baby, thinking about nurseries, hearing a lullaby – would drive me to tears. Not so much this time. At least not yet. Maybe it’s denial. Maybe it’s having done it once before. Maybe it’s just coping. Who knows. Sometimes my mind drifts to thoughts of wondering what went wrong. Was it something I did or didn’t do? I know the answer to that is “no”. But I can’t help but wonder. Thursday I go in for the D & C. By Thursday afternoon I will no longer be pregnant. I imagine I’ll be emotional, thinking about someone pulling my baby’s lifeless body out of me. Of never being able to hold that baby or see it or even know if it was a boy or girl. I will mourn. Then I will go home and hold my beautiful daughter close and most likely cry in to her soft sweet hair. I will snuggle with Samson and make him kiss me even though he pretends to hate it. I will lie in the strong arms of my husband and together grieve over the loss of our third child. 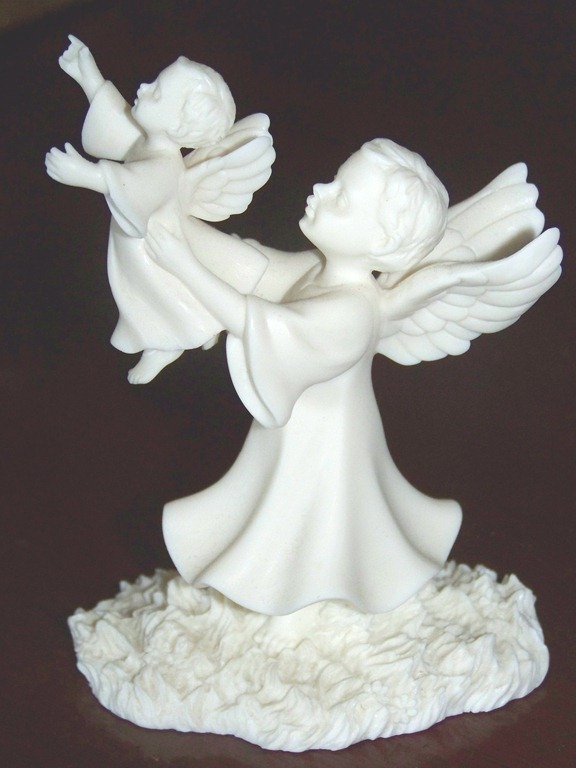 We now have 2 angels watching over us in heaven.